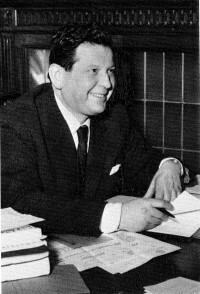 November 21 marks the 50th anniversary of the death of Bruno Leoni. Leoni was a scholar, political philosopher, lawyer, newspaper columnist, and one of Italy's leading 20th Century classical liberals. He was a Professor of Legal Theory and the Theory of the State at the University of Previa for a quarter-century, from 1942 until his death. He founded and edited the political science journal, Il Politico. He was secretary and then president of the Mont Pelerin Society. He was an admirer of Ludwig von Mises and had a great influence on Friedrich Hayek, among others. Leoni’s work merits remembering on this occasion because his murder a half-century ago silenced his insightful voice for liberty and because few Americans are even now aware of his contributions. In particular, it is worth revisiting his insights in Freedom and the Law, which powerfully addressed the risks “inflated legislation” posed to liberty. Contemporary legal systems…leave an ever-shrinking area to Individual freedom. [Where] authority always prevails…individuals must yield, regardless of whether they are right or wrong. The ever-growing power of governmental officials…interfere…almost at will, with every kind of private interest and activity. Legislation…has come to resemble more and more a sort of diktat that the winning majorities in the legislative assemblies impose upon the minorities. Decisions are made that simply consist in committing some robbery…against people belonging to a minority of the group. Reject the legislative process whenever it is possible for the individuals involved to attain their objectives without depending upon the decision of a group and without actually constraining any other people to do what they would never do without constraint. [Under] the inflation of the legislative process…everybody will be confronted sooner or later with…perpetual unrest and general oppression. Advocates of inflated legislation…[conclude that] what real people decide or do not decide within a society should be neglected altogether and replaced by what any handful of legislators may happen to decide for them at any time. There should be a drastic reduction…in the number of matters in regard to which [people] are allegedly represented…[and] a corresponding increase in the number of matters in regard to which people can make free decisions as individuals without being “represented” at all. The latter reduction thus seems to be the only path left for Individual Freedom to take at the present time. The ideal of “the rule of law”…[was] freedom from interference on the part of everybody, including the authorities. Individual freedom…has been gradually reduced in the last hundred years… [because] statutory law entitled officials to behave in ways that, according to the previous law, would have been judged as usurpations of power and encroachments upon the individual freedom of the citizens. If…there is no way of discovering by some objective method which is the most suitable choice for a political community…political decisions always imply an element that is not compatible with individual freedom, and therefore not compatible with a true representation of the will of those people. Nobody is more competent to know what one’s own will is than one is oneself. Therefore, the true representation of that will must be the result of a choice on the part of the individual who is to be represented. Let people work as they think best, provided that they do not interfere with the similar work of other people. While the market allows individuals to make free choices provided only that they are prepared to pay for them, legislation does not allow this. No representative system…can work properly while elections are held with the object of reaching group decisions by way of majority rule…to coerce the individual on the losing side of the electorate. Majority rule is unnecessarily substituted for individual choice. A golden rule…ought to be that all individual decisions that have proved to be not incompatible with one another ought to be substituted for corresponding group decisions. Everyone probably has more to gain from a system in which his decisions would not be interfered with by the decisions of other people than he has to lose by the fact that he could not interfere in turn with other people’s decisions. If I grant you the power to prevent me from hurting you, provided that you grant me a similar power to prevent you from hurting me, we are both better off…an exchange that is preliminary to any other. There is much to say in favor of…the general rule, according to which life and property of the citizens could not be disposed of by the state. Compare that general rule with those prevailing in almost all contemporary states, in which confiscatory practices or other limitations to the free choice of the individuals in the market [apply]…to all citizens. To sum up my views on this subject: There is far more legislation, there are far more group decisions, far more rigid choices…far fewer individual decisions, far fewer free choices in all contemporary political systems than would be necessary in order to preserve individual freedom of choice. Leoni’s Freedom and the Law clearly laid out the case against inflated legislation, which he recognized as the result of people seeking “the freedom to constrain other people to do what they would never do if they were free to choose for themselves.” In other words, such inflated legislation is incompatible with liberty, and the more its coercive reach expands, the more liberty is lost. He also saw the only ultimate solution for reclaiming liberty: “redrawing…the areas occupied respectively by individual choices and by group decisions…with their appendage of coercive procedures.” That is, “we have to reduce the powers of the legislators in order to restore as much as possible individual freedom… enabling individuals to make their own plans.” Fifty years after his untimely death, we would profit greatly by resurrecting Bruno Leoni’s insights.